Do Uber’s Self-Driving Cabs in Pittsburgh Offer a Glimpse of the Future? A century ago, the introduction of the electric starter – which was really nothing but an electric motor fitted with a gear wheel and a solenoid – looked like little more than a small engineering advance. You turned the key, the car started. Not a big deal? We don’t know if anybody at the time realized that those devices would bring about the end the jobs of chauffeurs who worked for wealthy families. (Remember, “chauffer” means “warmer” in French, and was the job title of servants who would hand-crank cars to life and get them warmed up for their owners.) But that’s what the electric starter did to a profession. It turned out to be a very small piece of technology with outsized implications. The sudden growth spurt in plug-in electric cars that use no gas whatsoever implied equally big changes. It will be a long time until gas stations disappear, along with mechanics who now how to repair gas-powered cars. But make no mistake about it, those trends are at least implied by the emergence of cars that use no gas. And now, Uber and Volvo have partnered to put self-driving SUV cabs on the streets of Pittsburgh. You’ll get in, tell the attendant (there still has to be one) where you want to go, and he or she watches to be sure the cab gets you there. So no big deal, right? Yes, very, very big deal. Because those self-driving Volvo cabs have immense implications for what the future might become. Here’s our list of what those implication are. Bear in mind, we are not saying that all these things will come to pass, only that these changes, and more, are implied by what is happening in Pittsburgh. The job of driving a cab could become extinct. This is the most obvious implication of the Uber/Volvo deal. But when you parse out what that trend could mean, you see that the potential disappearance of taxi driving as a profession will have an immense and far-ranging impact. As we know, driving a cab is the first job that many immigrants take when they come to America. If you get in a cab in Philadelphia and chat with the driver, for example, you are going to enjoy a conversation with someone from Ethiopia. At Newark Airport in New Jersey, chances are your driver will be Haitian. According to “American Born Cabbies Are a Vanishing Breed in New York,” an article by Matt Flegenheimer in the Feb. 9, 2014 New York Times, only 8 percent of New York taxi drivers that year were born in the United States. So make no mistake about it. If the profession of driving a cab dwindles or disappears, that will mean big changes in the way many Americans work, get a start here, and support their families. More people could decide to avoid owning cars. Of course, we are already seeing this trend at work in major American metro areas, where a growing number of people like to rent cars, not but them. Zip Cars are part of this trend too. But now that Uber is extending its reach beyond metro areas, the result could be that more and more Americans will decide to stop buying cars. Again, the implications could be immense. In 2015, Americans spent a total of $570 billion on new cars. If only 10% fewer Americans decide to buy cars, that would result in a whopping loss of $57 billion to both car makers and the GNP. And you can roll the numbers out from there. Do we know this is going to happen? Again, no. But the trend could start to happen as soon as the first door of an Uber/Volvo cab opens in Pittsburgh and a passenger gets in. People are not going to need their own navigation tools. In a sense, this trend started when people tossed their road maps in favor of those early Magellan and Garmin GPS devices. It grew even bigger with the emergence of navigation apps for smartphones. And today, Uber users generally rely on the Uber apps, and those used by Uber drivers, to navigate them to their destinations. Why fire up a separate GPS app at all? And the trend seems likely to grow bigger. Stoplights and other common traffic safety pieces of infrastructure will start to go away, then disappear. If cars are entirely self-driving, there will be no need for stoplights. If nobody is looking, who needs them? And there are even bigger implications for computerized systems that control the flow of traffic in and around cities. And here is a happy thought . 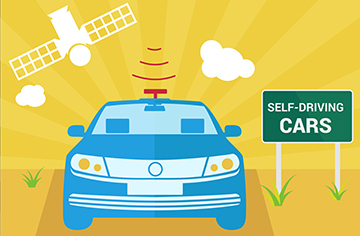 . . no more detours, because self-driving cars will take the right route around areas where roadwork is happening without the need to inform drivers. Dramatic changes will occur in traffic monitoring and law enforcement. America will always need police officers, there is no doubt about that. But if traffic on roads and highways proceeds in one computer-synchronized flow, the need for certain kinds of police work could eventually disappear. So could the need for radar guns and radar detectors. Again, we are not saying that the arrival of self-driving taxis, or of self-driving cars in general, is going to cause all those changes to transpire. But we do know that when one pebble is tossed into a lake, the ripples it generates travel far and wide. We also know that self-driving cars are a boulder, not a little stone. There is hardly any way to predict exactly where all these technologies will lead.